Dear Ryoko, I got the car on Sunday 23rd may and am happy to have received it intact. Thanks and good day. Hi Dean, Picked up the car yesterday from AA - nothing to be done! A very neat clean car. I would like to thank you and the entire company of Trust Ltd for the cooperation and honesty in the car transaction i had with the company. Although the vessel (Le Mans Express) that shipped the car took more than a month to arrive in dar es salaam due to route changes, i finally got the car. I thank you once again for all the effort and cooperation. 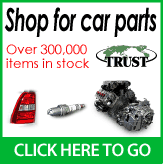 I have already recommended Trust Ltd to a friend who will be sending his car order soon. I confirm receipt and collection of my car Nissan Wingroad as per the above reference. The car itself has a very, very strong engine and a lovely outer body skin. Thank you again for your good service to your customer. Now I am proudly driving it in my own country, the DR Congo. I will revert to you again for a second car in the near future. Best regards to all your team and see you later. i would like to confirm and thank you all for your services rendered on my car; the Toyota Windom.i received it and in good condition,i hope to do business with you again in future. good day. Trust Company keeps it up! My sons and my wife are all very happy for having a nice car (Toyota Ipsum) from you. They say “now we have picnic car”. The car is in a good condition and I am sure we gonna enjoy it. Thank you. Dear TRUST Company, This is to inform you that I have already received the vehicle and cleared it from the port. It is a very beautiful PRADO. I am particularly appreciative on how you have been so communicative in the whole transaction, right from the beginning to the end. I thank you very much. How are you? I am glad to inform you that I have received the car in good sound condition and I really appreciate your efficacy and efficiency. And now I use it accordingly. I promise to be your regular customer and let me posted on all matters pertaining to your vehicles. Thank very much. Thank you. I received my car in good condition the car is perfect in good condition. Once again, Thank you to Wayne, Ryoko and all your team for your devoted ,professionalism way of working, and Trust compagny it 's really a TRUST one! I already started recommanding my friends/colleagues to rely on you people! Thanks for all!! Dear Wayne, This is to inform you that the car (details below) purchased from your company has arrived. Thank you, and it was good doing business with you. Until then, bye for now. Dear Yoko, Many greetings to you. […] Then, I would like to inform you that I received also the Toyota Premio. It is in very good condition. I like it very much. Thank you once again. Hi Wayne, How are you? This is just to let you know that i received the vehicle in good condition. Thank you for your efficiency as an individual and as Trust company. Please keep it up as i recommend you guys to my colleagues! This is to inform you that I have received the vehicle intact and in superb condition. It was indeed a good buy and I may well be doing business with u again. Hello Yuki, I pray and hope that you are well. I am sending this email to acknowlwdge that the vehicle you sent has finally reached me. It is a beautiful piece of machine. It has arrived intact. Looking forward to futre buys from you. May I through you thank all staff at Trust Company who made this transaction fruitful. Keep up the team work and excellent service.